With seven months to go until the Rio+20 conference on sustainable development, Brazil is uniting in support of proposals to be included in the summit's draft final document, which aim to transfer its successful national social and environmental sustainability programmes to the global scale. The Brazilian national commission for drawing up the proposals, created in June and made up of 30 ministerial delegates and 40 representatives of civil society, has delivered its document to the United Nations, as have 70 other countries and a number of NGOs, making a total of 600 documents to be discussed at the United Nations Conference on Sustainable Development, better known as Rio+20, to be held in June 2012 in Rio de Janeiro. Claudia Maciel, general coordinator of sustainable development at the Brazilian Foreign Ministry, told IPS that Brazil aspires to the ambitious goal of creating the Sustainable Development Goals (SDGs) at this conference. Brazil proposes establishing global goals for sustainable social and economic progress for the period 2015-2030, as a kind of expansion of the targets adopted by U.N. member countries in 2000 under the Millennium Development Goals (MDGs), which have a 2015 deadline and take 1990 indicators as their baseline. 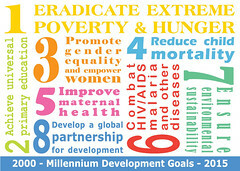 The MDGs include eradicating poverty and hunger, achieving universal primary education, promoting gender equality and empowering women, reducing child and maternal mortality, combating HIV/AIDS and other diseases, ensuring environmental sustainability and forming a global partnership for development. Rio "clothed all in green-oh"
As Rio prepares to host the 2012 U.N. Conference on Sustainable Development, local authorities have announced that it will be the world's first major city to adhere to an initiative for assessing sustainability and reporting its economic, environmental and social performance. The Global Reporting Initiative (GRI), which evaluates administrative transparency and sustainability levels, produces international standards for sustainability reporting consisting of 77 economic, social and environmental indicators, to measure the economic, environmental, and social performance of an organisation or city. "As the host of Rio+20, Brazil, and especially Rio de Janeiro, must have the strength to transform into concrete achievements" the commitments reached by the conference, said the mayor of Rio, Eduardo da Costa Paes. Rio de Janeiro has thus become a pioneer among the world's cities, committing itself to collecting extensive data to monitor its sustainability. So far, only nine other cities in the world have followed in Rio's footsteps and adhered to the GRI. They include Amsterdam, Melbourne, and smaller cities in Sweden. In this respect, Rio is ahead of megacities like Paris and London, which have not announced whether they will participate. The first sustainability audit of Rio de Janeiro is due to be published in April 2012, ahead of Rio+20. "The idea (of the SDGs) is to launch broad goals that will mobilise countries, as the MDGs managed to do. For instance, the goal of reducing poverty, but taking environmental aspects into account and focusing on sustainability," said Maciel. The difference between them is that the MDGs are goals that had already been reached by industrialised countries, while the SDGs affect everyone on the planet equally, she said. "We are going to try to foster this debate at the conference. We are aiming to integrate the agendas of countries and of the U.N. agencies themselves. The idea is not to enter into conflict with the MDGs, but to complement them," Maciel said. Another Brazilian proposal which may attract attention is the creation of a global social and environmental protection programme, similar to Brazil's Bolsa Familia (Family Subsidy) initiative, a cash transfer programme conditional on children receiving health care and attending school, but in this case made conditional on action for environmental protection. "We are examining our experience to promote solutions at the global level. Without a doubt, this is another ambitious proposal," Maciel said. On the economic front, the Finance Ministry has suggested creating a public procurement system that favours the most sustainable industrial processes, since around 15 percent of global GDP goes to public purchases of goods and services. This proposal aims to develop a criterion of sustainability for government purchases. According to Maciel, some countries have already adopted this practice, but they are in the minority. Brazil itself has not yet officially adopted this measure. In spite of efforts to foster participation by civil society in the drafting of the Brazilian document, the public input process was imperfect, and the document is only a summary of the thousands of issues raised, Maciel admitted. Some specific issues, like nuclear energy, are entirely absent from the Brazilian document sent to the U.N.
"The document reflects a consensus, and this was not achieved on the nuclear issue," Maciel said. Another matter that was not included was that of climate refugees, people displaced by climatically induced environmental disasters. This issue "was not raised with sufficient force to be incorporated in the text," she said. But the toughest challenge will be to reach a consensus on the final declaration at the Rio+20 conference itself. In Maciel's view, reaching a consensus is essential, in order to unite the world behind solutions for the severe problems resulting from the current development model. "The crisis is generating demand for changes. A new model has to be discussed. The proposals are still too general and they need to be considered in greater depth," the Brazilian diplomat stressed. U.N. Under-Secretary-General for Economic and Social Affairs Sha Zukang, who is also the secretary-general of Rio+20, said that a single development model with a protectionist bent will not be imposed at the conference. "The emphasis in the green economy is on a way of dealing with economic decisions, valuing nature and debating social issues," said Sha, who was in Rio de Janeiro Nov. 23 to report on advances and challenges in the preparations for the 2012 conference, which is being held two decades after the first Earth Summit, or U.N. Conference on Environment and Development. One of the major challenges is to build a consensus around the forthcoming draft text that defines the final commitments of the U.N. member countries, Sha said. He said he hoped member states will be able to agree on the "green economy as a pathway to sustainable development" and come up with a "tool kit" for the implementation of the principles that they will agree on, based on examples of best practices worldwide. Sha also supports the idea of creating a U.N. Sustainable Development Council, similar to the Economic and Social Council (ECOSOC), to integrate the social, economic and environmental pillars of sustainable development within the U.N.
A meeting will be held Dec. 15-16 at U.N. headquarters in New York, to determine the format and structure of the contents of the Rio+20 final document.